This week I'm giving you my "perspektive" on Ms. Spektor's latest effort, Far, released late last June. Before this album I hadn't heard any of her songs on mainstream radio. Now when I tune into 101.7 WFNX I'm almost guaranteed to hear a song by her, making Far Spektor's most commercially acceptable album so far (no pun intended. Or was it). 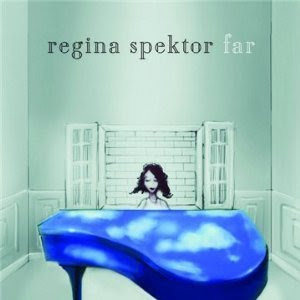 It's funny the way that happens, Regina Spektor has released several albums before Far with little commercial appeal. Years later she's being played on a loop at radio stations. The funny part is, this album (although it is good) is not her best work in my opinion. Now, don't get me wrong... I love this album, it just isn't her best (try Soviet Kitsch). I don't know why, Far just didn't strike me the way her other albums have. There are plenty of great moments on this CD though. One of my favorite tracks is "Genius Next Door", a classic Spektor diatribe. The lyrics are moody and full of imagery and her piano work is elegant throughout the song. Another good cut, and one that's seen a lot of radio play, is "Eet" (eat). She reprises the lyrics from the opening in the third or fourth verse and changes her inflection, adding emphasis and emotion on the words; it's really something special. The only part of this album where I really stepped back and said "I don't like this at all" was during the dolphin sounds she makes on "Folding Chair". She's quoted in Spin Magazine saying, "I could have just sampled a dolphin but barking like one is so much more fun to do." That I can totally respect, but do I like it? No. **Design Girl here. I don't usually weigh in on the music posts, but I'm a Regina lover so I had to put in my two cents. While I agree that Far isn't as amazingly amazing as Spektor's older albums, I loved the songs "Machine" and "Dance Anthem of the 80's"...they'll definitely add some quirky fun to your day. In a mellow mood? Try "Laughing With," and "Human of the Year." This album isn't as raw as her other albums which is probably why it's gone so commercial and has less appeal to her old fans; this album has a studio feel to it. Still, it's decent and definitely worth your money.